Thanks to Joann Arrington of Fairplay, S.C. and to Daniel and Henry Tollison for these letters. The following letter is one of several written by Private G. W. Davis, (George W. Davis) to his family. This letter is written very shortly after the fall of Vicksburg and the fall of Jackson, Mississippi. Suffering from poor water, no food, and defeat, moral is at a very low point. Private Davis served with Company "B" and "E" , Sixteenth South Carolina. The letters are held by Ms. Joann Arrington of Fairplay, South Carolina and were furnished as typed transcripts through the kindness of Henry and Daniel Tollison. Private G.W. Davis served from 1863-1865 with the Sixteenth South Carolina. It is unknown if he returned to service following his wound at Franklin. He is listed in Company E in the Taylor and Memory Rosters but cites Company B within his letters. He was born on 6/21/45 and died 4/4/19 and is buried at Washington Church near Pelzer, South Carolina. Private Davis was wounded at Franklin and served a prior enlistment in the Bozeman Guard of the Hampton Legion. Some of his letters from his prior enlistment survive. 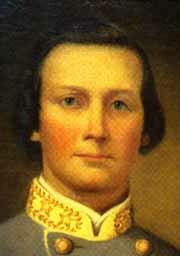 He was wounded slightly during the Peninsula Campaign, probably at Seven Pines or Gaines Mill. By the time of his service with the Sixteenth the days of plenty have passed and he is condemned to serve with little food or clothing, this is the beginning of the end. Also, as shown in these his later letters, the glory of war as seen through the eyes of a young man are long passed, as well. Like most soldiers, particularly old Confederate soldiers, the image left by his words is gaunt, starved, half naked, and very very lonely for an about to be lost home. I now take my pen in hand to anseur your letter wich I recived on the 16. The state of affairs in Mississippi in now very bad. The yankees has got possession of vicksburg and Jackson. We are now retreating from Jackson. We started last night at dark and marched all night and all the next day without any thing to eat but a little cornbread. The yankees had like to had us cut off and we had to retreat all night. I think we are now already whiped for he has got so many of our states it reported that Charlseston is taken by the yankees and if that is so we had as well give it up. This letter leaves me well as common only I have got a risen on my hine but it is getting better. The reason I did not write oftener was I did not have the chance to write for the yankees was shelling us so bad that we had to stay in the ground. We had holes dug in the ground to git in when they shelled us. I will come to a clos you must write soon for I want to hear from you all I hope this will find you all well I still remain your true son until death. Charleston had not fallen, and the Confederacy still had at least two more years worth of fight in her... but the handwriting was on the wall, as she was on the way up the spout.